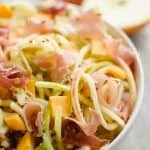 Spiralized Apple, Cheddar & Prosciutto Salad is a fresh and healthy salad with amazing fall flavors. 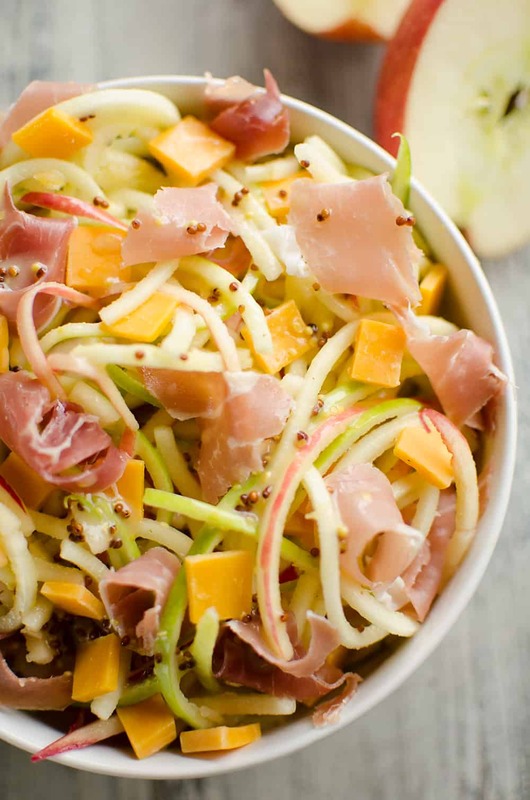 Sweet and tart apples are combined with sharp cheddar and salty prosciutto tossed in a light honey Dijon vinaigrette. We all know Spiralizers are great for vegetables like these Spicy Roasted Sweet Potato Spirals or the ever popular spiralized zucchini, but fruit shouldn’t be forgotten either! 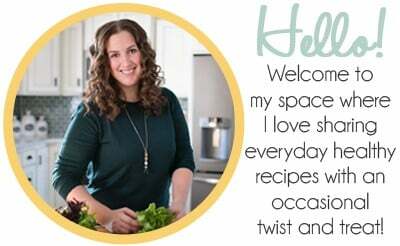 I’ve used my spiralizer for this Spiralized Apple Cranberry Salad in the past and it was a huge hit with all my family as well as my readers. It’s a fun way to present fruits and vegetables in an exciting new way. 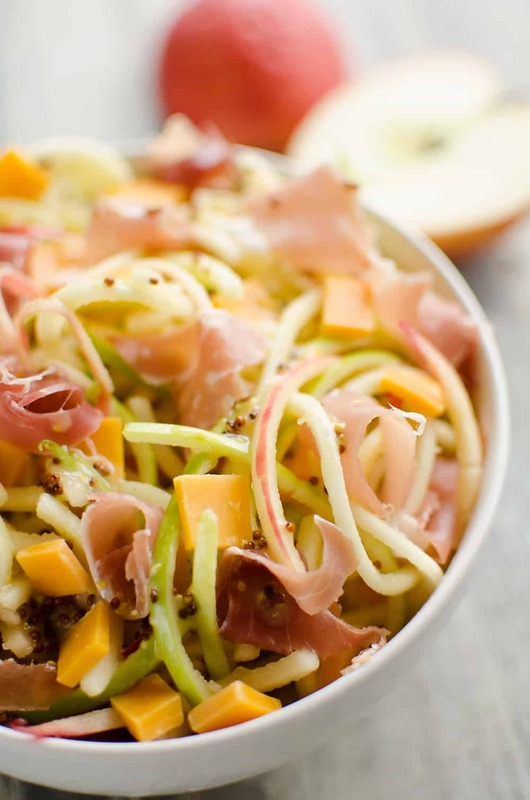 This Spiralized Apple, Cheddar & Proscuitto Salad is no exception! I used to think people were crazy when they said apples and cheese went together. I would look at those Wisconsin people who put a slice of cheddar on their apple pie like they were loosing their minds! That is until I went out to eat at The Melting Pot restaurant and they served sliced apples with their cheese fondues. I thought that sounded awful, but decided to give it a try anyways. It turned out the pairing of apples and cheddar was fantastic and I had been missing out all my life! 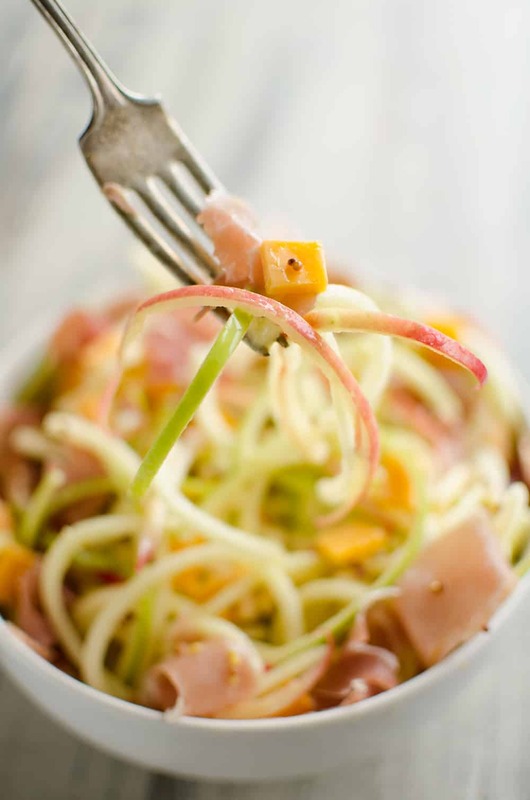 While we thankfully (for our waistlines) aren’t having indulgent fondue very often, I can still enjoy the combination of flavors in this light and healthy Spiralized Apple, Cheddar & Proscuitto Salad. 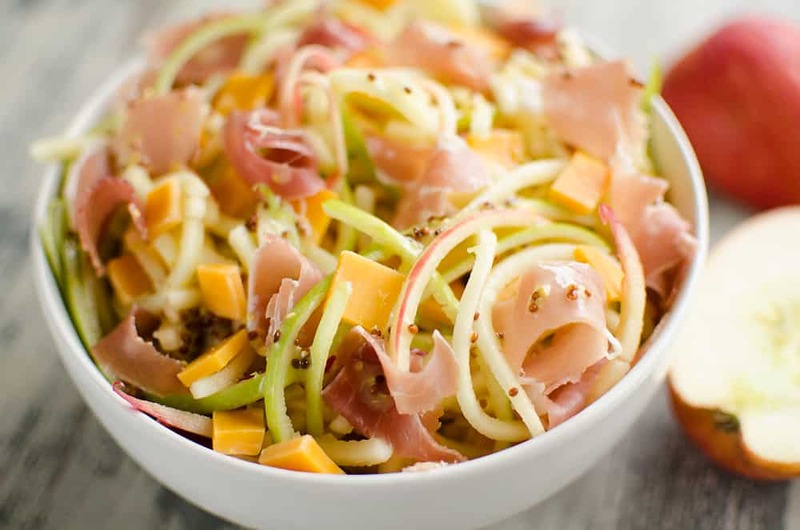 The mixture of sweet and tart apples along with the salty prosciutto and cheddar and fresh honey Dijon vinaigrette is a combo that you truly must try! In a medium bowl, whisk together the honey mustard dressing, lemon juice, honey and whole grain mustard. To the bowl, add the apples, cheddar and prosciutto. Toss until well combined. 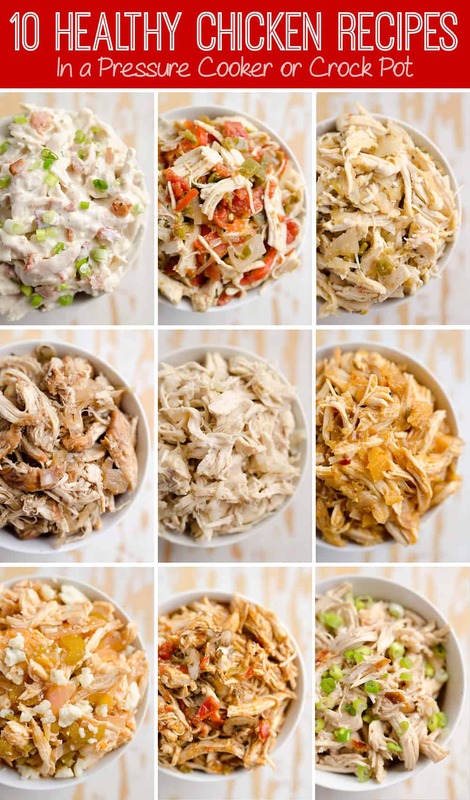 Serve immediately or store refrigerated for up to 48 hours. So simple, yet it looks super delicious! I’ll sure be trying this during the week!